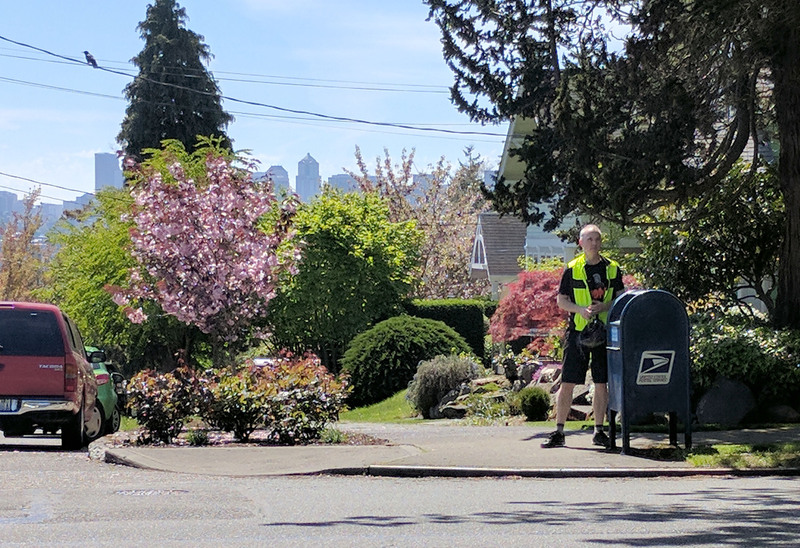 152) Bike series (1/15) I was looking at my big map-o-mailboxes, and I realized there was a large string of uncaptured boxes forming an enticing loop through Fremont, Ballard, and Greenwood. At that point I knew what had to happen… another Bike Adventure! I rolled out at 5:30 a.m. and visited my first target shortly thereafter. See that guy along the right side of the picture? He was yelling for someone named Jeremy, so if that’s you, you might want to head over an see what he wants. 124) I was recently discussing this project with someone, and they raised the idea of photographing pay phones. 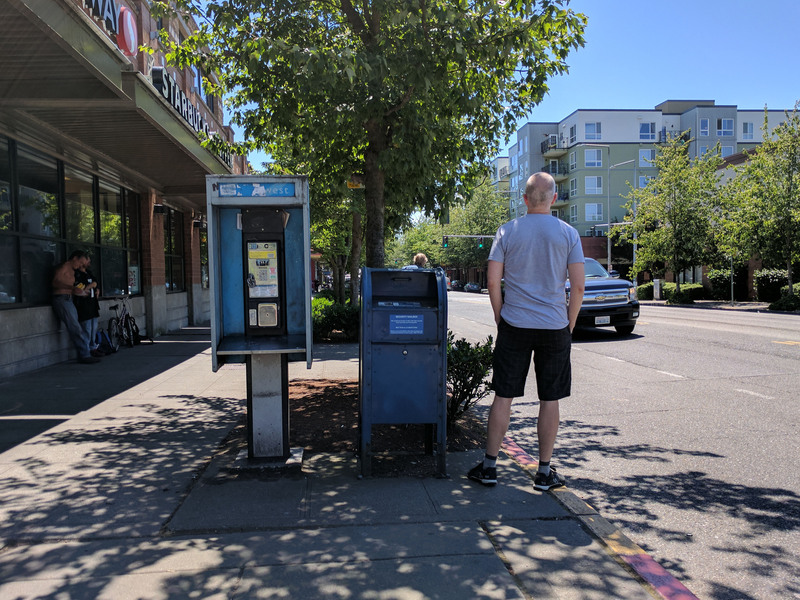 Well, that may have been viable a decade ago, but today you could probably visit every pay phone in Seattle in the span of a couple hours. 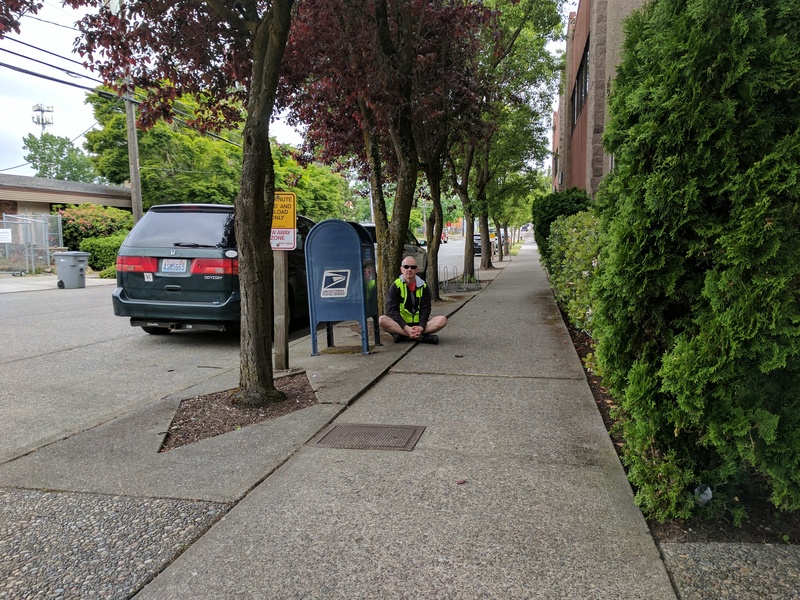 I was actually quite surprised to find this one camped out in front of Safeway, resolutely standing proud next to his mailbox friend. The handset is long gone, so at least it doesn’t have to deal with pesky humans anymore. 111) Bike Series 8/8. Our thrilling bike adventure comes to an end with a surprise finish! This box was not even on my list of ones to capture on this trip, but as luck would have it I came across it after I thought I was done for the day! Unfortunately, what this picture does not capture is the sound of the barking dog coming from behind that fence. He does not like anyone messing with his mailbox. 110) Bike Series 7/8. This proud collegiate mailbox serves the fine student body and faculty of North Seattle Community College. I imagine it used to be stuffed with letters to parents asking for money, but nowadays it’s probably empty most of the time since we all know that college students can’t afford stamps. 109) Bike Series 6/8. To be honest, I’m not really sure if this location still qualifies as Oak Tree, but my maps don’t give me anything better to work with. 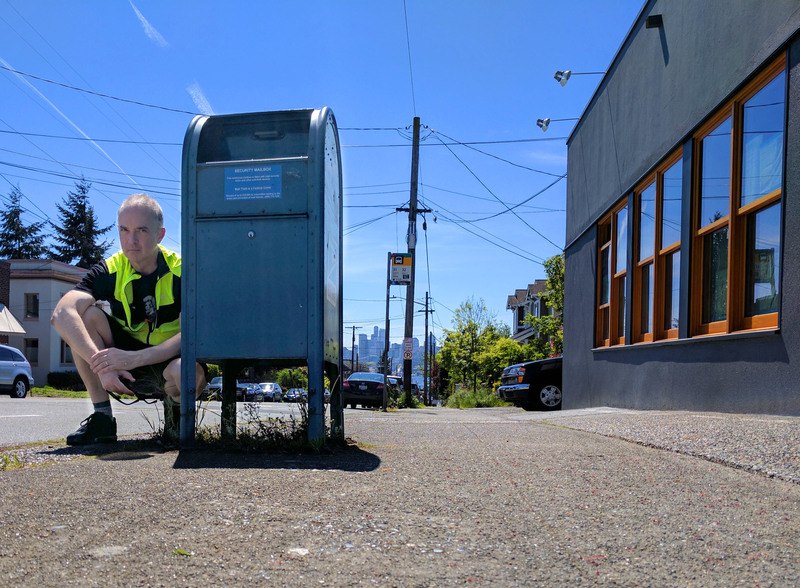 Anyway, as you can see I decided to use this opportunity to take a short rest and just chill on the sidewalk with this fine mailbox. It seems to serve the tenants of the office building on the right, and since no one was there at the time, I thought I’d keep it company for a while. 104) Bike Series 1/8. Guess what? It’s time for another exciting bike series! 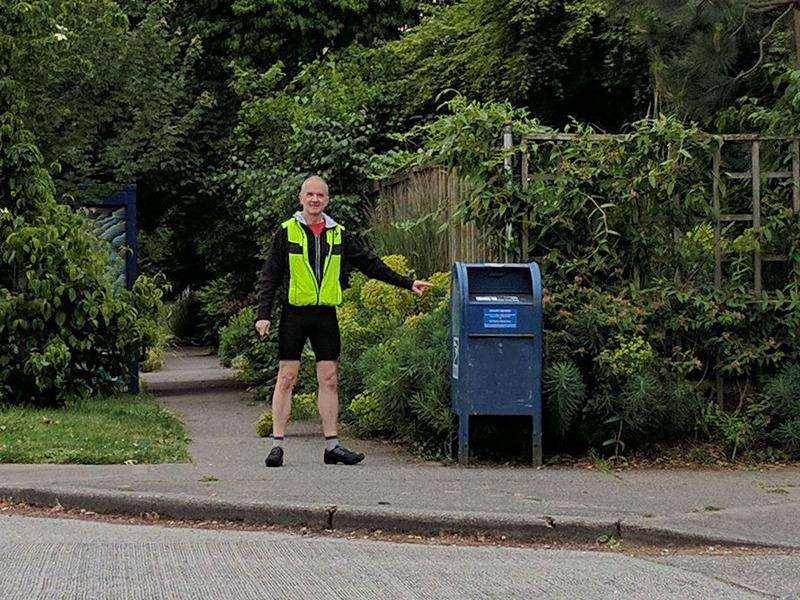 This morning I noticed that I only had a couple mailboxes left in the 98133 zip code, so I thought I’d take a quick spin up north to pick those up… but then I noticed I’d be passing several other boxes along the way. It was obvious what I needed to do — create an eight-part bike series! 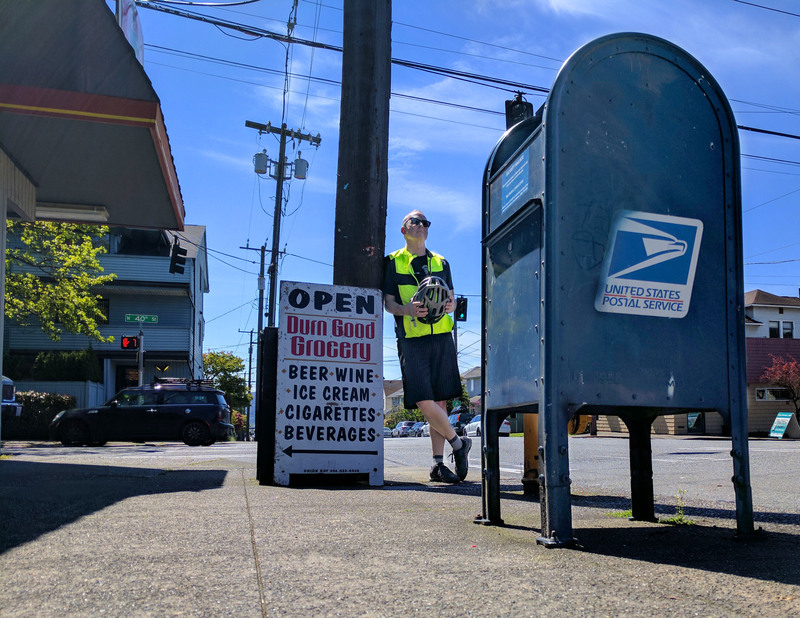 This box on Fremont Ave N was my first stop and it provided an excellent opportunity to get in a quick bit of stretching before pushing north. Tune in tomorrow to see where the journey takes me! 94) This was one of those happy chance encounters that just doesn’t happen often enough. 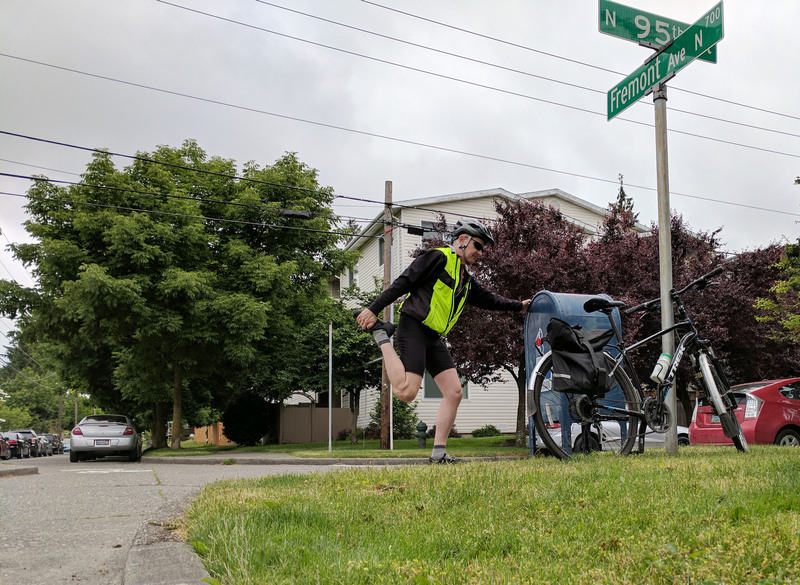 I was test-riding some new pedals on my bike and sticking to quiet, low-traffic side streets. 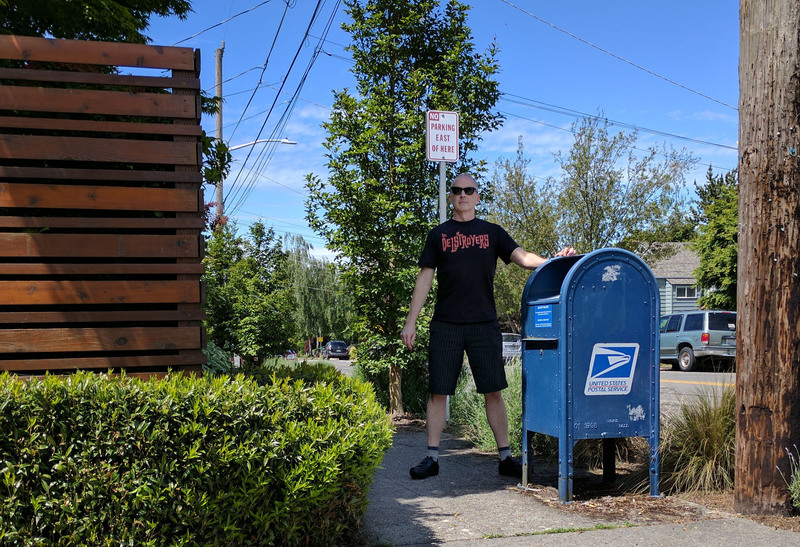 When I came upon this yet-to-be-photographed box in Meridian on N 56th Street at 1st Ave NE, I figured “hey, might as well get it.” Plus, it’s a good opportunity to show off my sweet new Delstroyers t-shirt. 73) Bike series (7/7) Our stunning bike series through Wallingford concludes with this box poised on N 40th Street at Sunnyside Ave N. As you can see, the box has a lovely view of downtown, which probably looks extra nice at night. 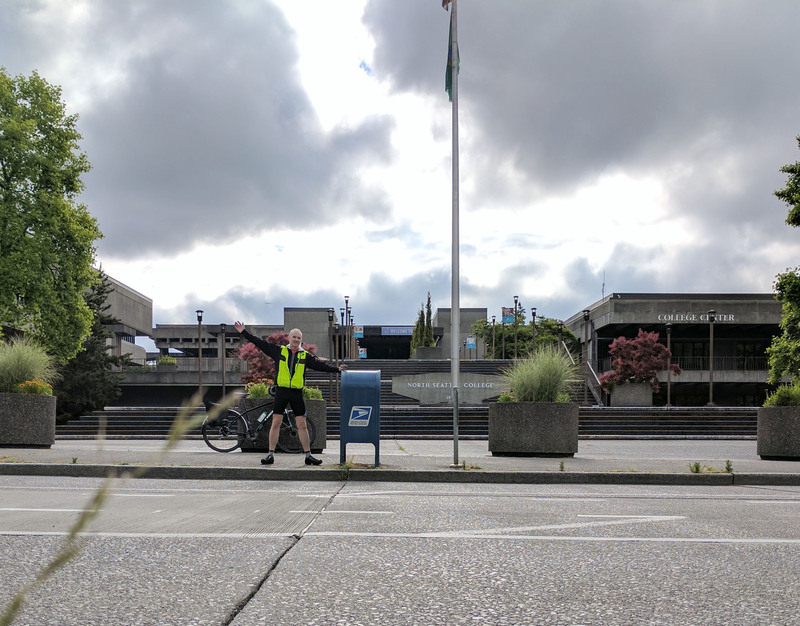 Thanks for joining me on the cycling adventure! We’ll return to the regular random stuff tomorrow. 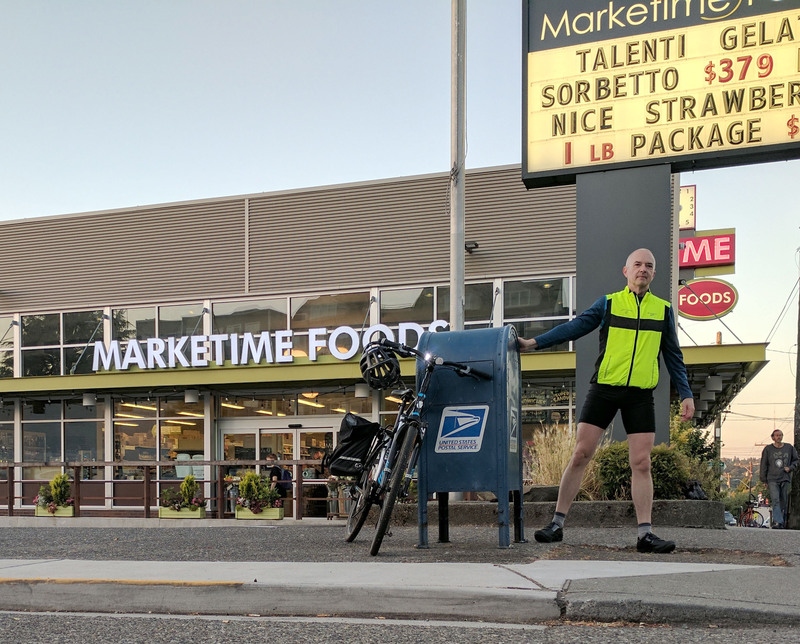 72) Bike series (6/7): Continuing north along Wallingford Ave N gets us up to N 40th Street, where we find this jovial mailbox sharing a sidewalk with the famous Durn Good Grocery. I really think this must be one of the happiest mailboxes in the area. How could it not be?